We specialize in taking small groups to John Pennekamp Coral Reef State Park to see the amazing underwater world. You will see our amazing reefs covered in fish of all shapes and sizes. The visibility is often crystal clear and you can see the bottom before you get of our boat. Our boats have a purpose built swim step on the back that makes it real easy to get into the water and a large ladder with 4 steps to ensure you can get back on easily. Snorkel Trips depart at 8.30 and return at 12 noon and again at 1pm returning at 5pm. It takes around 45 minutes each way to get to the reef and back giving plenty of time to snorkel. We go to two separate snorkel sites and spend up to an hour at each site. 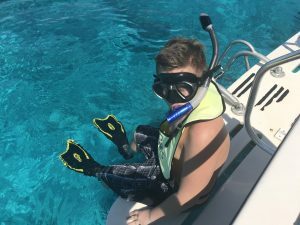 Snorkel Trips include Mask, snorkel, fins, safety vest and wetsuit if required. On board we also provide Iced Water, cookies and a great sense of humor. We know that you will have a great time! If you have not snorkeled before our crew will give you expert instruction before you get into the water. If you would like to have a guide in the water with you we can arrange this at a small additional charge of $50 for up to 6 people. Our boats are licensed to carry 22 snorkelers but we usually carry between 10 and 15 so comfort and service levels are high! If you have a lot of friends you could take advantage of our special Full Boat Rental for $550. This has the same high level of service as our standard trips except you will have the complete boat to yourselves! We advise that you make reservations at least a day in advance. Either call or email us for an instant reservation! One of the most popular Snorkel Trips is to the statue of Christ at Key Largo Dry Rocks. 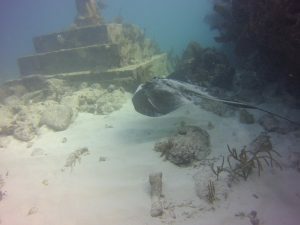 Its a great site with lots of reef fish and we often see Stingrays there. We visit all the reef snorkel sites from Elbow reef to Molasses. Our crews know the reef and will not just take you to the standard places but will assess conditions of the whole reef and take you to a great snorkel site that will have the least crowds on it. If the Weather is not good to go to the reef? 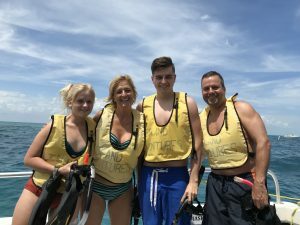 When weather does not allow our Snorkel Trips to go to the reef we run eco tours out on the Bayside where we take you to the mangrove Islands and you can snorkel Key Largos fish nursery. We can often see baby sharks, Sea Horses and all manner of small interesting critters. This tour also includes passage through Adams Cut and under the US1. Want to try SCUBA diving on the reef? We can teach you the basics of SCUBA diving in the morning in our lagoon and take you out for two dives on the magical reef in the afternoon! Check out our Discover SCUBA Diving program.